There is yet another label being thrown around in today’s over labeled and categorized scene of metal. It seems as if there are more variations of metal these days than there are different types of blue crayons in a 500 count box of Crayolas. A new form is doom metal and yes, as you probably envisioned from the label, it’s not exactly indicative of Ren and Stimpys’ “Happy, Happy, Joy, Joy” vibe. Pilgrim, heralding from Rhode Island, is a part of this new breed of metal. They’re not re-creating the wheel, but they are putting their own spin on a familiar sound. The band’s sound is a throwback to the dark, brooding sound of early Black Sabbath, yet updated for today’s listener. 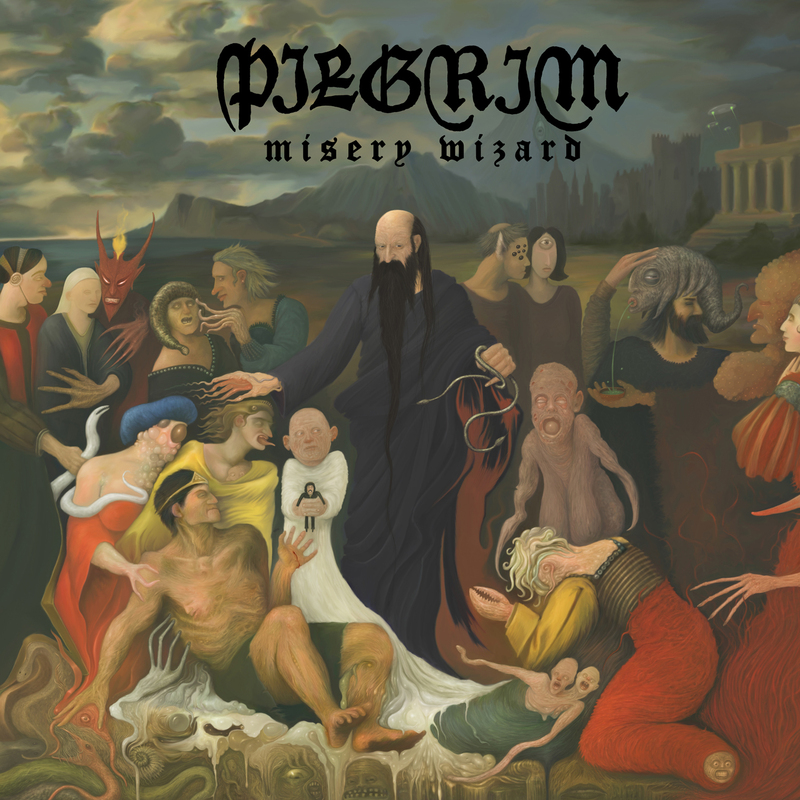 The band, consisting of The Wizard on guitar and vocals, Krolg – the slayer of man on drums and Count Elric the Soothsayer on bass, is poised to release their debut record Misery Wizard on Metal Blade Records on February 12, 2012. The album is only six tracks and it clocks in at almost an hour with the longest track clocking in at 12:54. The opening chords of the first track, “Astaroth”, immediate bring on the Sabbath comparisons. The guys are in no rush to blitz your senses with an assault of your senses. They take their time in their dark and brooding layout of the song. There are a lot of bands that smash you in the face and bash you over the head with their songs in short, three minute intervals. Pilgrim is the unabridged version of a song as opposed to the cliff notes version, yet they do so effectively. “Forsaken Man”, clocking in at 12:54, is the longest track on the album and one of the best examples of showing exactly why this band is great at doing what they do. The band are storytellers through their song and music and they take their time weaving that story. It twists and turns and weaves in and out, but it all connects together. The dark guitar chords, a bass that rattles your chest and drums that prove sometimes less is more. The title track is a creepy number that could double as the soundtrack for an apocalyptic horror movie. It’s heavy, yet melodic and maintains its brutality. The song clocks in at 10:44, yet never drags on at any point. The Wizard does Tony Iommi proud in his approach to laying out a song and not rushing the results. There are those fleeting moments on songs such as “Quest” and “Adventurer” that show the band pushing the pedal down a bit and picking up the pace a bit during which they are just as menacing. If dark, brooding, retro psychedelic rock is your cup of (insert beverage of choice), then you will want several cups from Pilgrim. The guys put their touch on an old sound and make it contemporary without losing its effect. It’s an album that’s hard to just pick out one track and play. It’s best if you listen to the entire thing at one sitting and enjoy the entire trip.